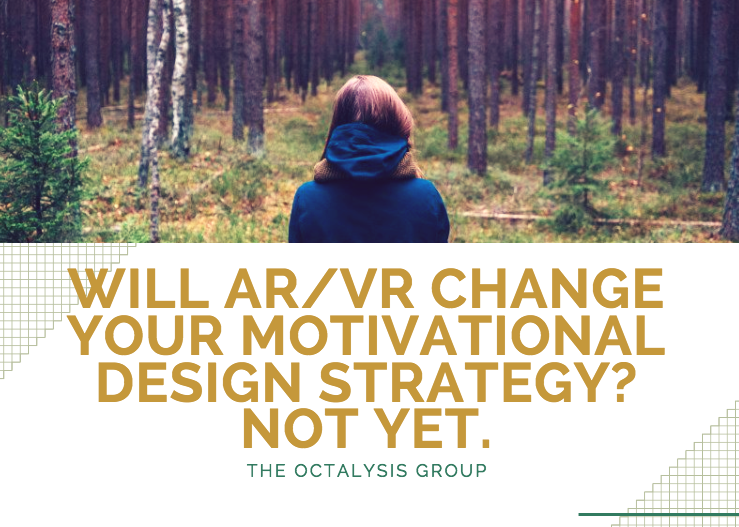 Home > Gamification > Will AR/VR change your Motivational Design Strategy? Not yet. Will AR/VR change your Motivational Design Strategy? Not yet. Imagine you are inside an Amazon strategy meeting. You listen to everything Jeff Bezos says, you hear everything he hears, and see everything he sees. You are sitting on the lap of the CEO of one of the fastest growing companies in the world. And you are there when they decide their next move! This would be a virtual reality experience potentially more valuable than a semester-long course on entrepreneurship at your local MBA program. So far, this isn’t the kind of experience that augmented reality or virtual reality has given us. Augmented reality and virtual reality have been pitched as the solution to many human problems. Pokemon Go got millions of unhealthy teenagers outside and exercising! Technology futurists consistently describe the utopias AR and VR might bring to humanity. But until humans no longer think like humans do today, we still need to design for humans. Here’s why VR and AR won’t consume the world right away, and also why you can’t forget human-focused design if you are designing within AR and VR experiences. Even if the platforms we use change, if the experience is not designed with Octalysis it may still not be engaging. In one important way, VR is suffering from the common pitfall many evolutions of gaming consoles suffered from: graphics before gameplay. When developers and designers spent too much of their time maxing out the aesthetic capabilities of a new medium, they often forgot to make the games fun to play. Everyone can think of a list of their favorite games and notice that some of their favorite memories of gameplay had little to do with the quality of graphics. Tetris’s graphics aren’t great, but it is still a great puzzle game. 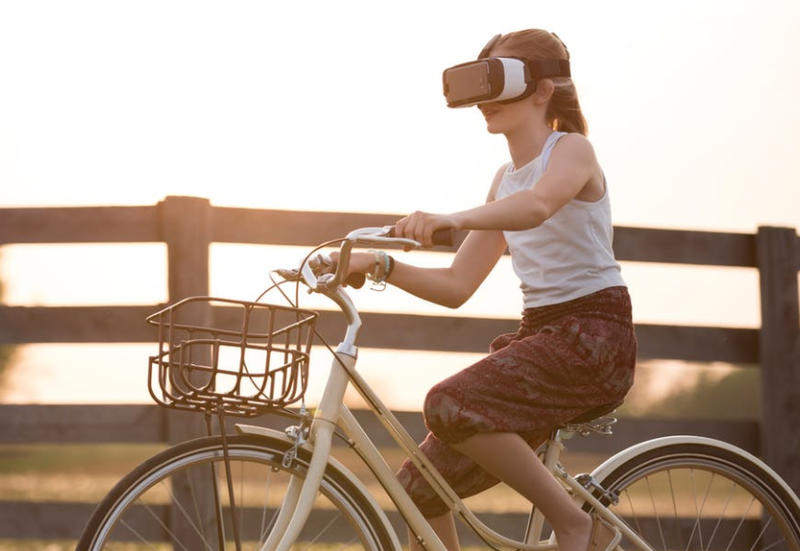 Virtual reality (VR), which can be referred to as immersive multimedia or computer-simulated reality, replicates an environment that simulates a physical presence in places in the real world or an imagined world, allowing the user to interact in that world. The keywords with VR are presence and immersion. And it is here where all those funny-looking glasses are relevant. They are called Head-Mounted Displays (HMD) and we have big players producing them. 360º videos are recordings of a real-world scene, where the view in every direction is recorded at the same time. During playback, the viewer has control of the viewing direction. 360° video is a version of VR created with only real-world content. There is a whole YouTube section dedicated to these kinds of videos. Keep in mind you should watch these videos with some device like Google Cardboard on (they can be considered a cheaper, and more limited, version of the more expensive HMDs). Most 360° videos currently play on Core Drive 7: Unpredictability & Curiosity. Augmented reality (AR) is an overlay of content on the real world, but that content is not anchored to or part of it. The real-world content and the computer generated content are not able to respond to each other. The keyword with AR is utility. The perfect example here is the Google Glass, since it was created to enhance our real world experience (unfortunately, it was not a huge success). Finally, we have Mixed Reality (MR) – sometimes referred as Hybrid Reality – as an overlay of synthetic content on the real world that is anchored to and interacts with the real world. The key characteristic of MR is that the synthetic content and the real-world content are able to react to each other in real time. Pokemon Go had many game elements that were carefully designed but lacked an endgame that captured mass appeal (not enough Core Drive 3: Empowerment of Creativity & Feedback). Experiences like Pokemon Go, which balance careful behavioral design with the state of the art aesthetic experience have better chances of adding value. Daily, new media reports build hype around potential gamechangers, like VR games influencing medicine, Disney’s use of mixed reality for shared experiences, or Stanford’s fencing marketing campaign. Notice how in each of these examples, the VR experience is being designed with the human in mind, from Epic Meaning & Calling in medicine, to Social Influence & Relatedness in the shared experience, to Unpredictability & Curiosity in the fencing example. These examples are using motivational design within the context of the new medium. The experience itself is frame around a core activity loop that keeps the user in the experience through investment and reward cycles. How will VR/AR impact motivational design? As VR/AR progress along the Hype Cycle through technology trigger, peak of inflated expectations, through the trough of disillusionment, and into the slope of enlightenment and the plateau of productivity, you might ask the question: how will VR/AR impact motivational design? On one hand, the answer is simple. Until humans no longer think like humans, these mediums won’t change the core behavior and motivations inherent in human brains. So, it will instead be a question of how motivational designers apply frameworks like Octalysis to these new mediums. From this point of view, AR and VR will only become widespread if expert motivational designers are included in the teams working on these technologies. Motivational design cannot be integrated into your design after the fact. Motivational design needs to be at the core of your design process. At The Octalysis Group, we take this element of design very seriously. Are you creating an AR/VR project?